Jim Nutt’s latest retrospective is not an exhaustive survey of his work, to which he was treated in 1994 in Milwaukee, but a pointed curatorial thesis on his most important and enduring subject: women. Curator Lynne Warren worked with the artist to shape 45 years of material into a historical arc. In essence, the exhibition begins where it ends, seeking to explain the evolution of Nutt’s career in light of his mature output. Sometimes it takes the long view to tidy the past and define the present. Nutt rose to early prominence in the mid 1960s with the Hairy Who, the dirty uncle of New York Pop. During this period, when Valerie Solanas published her “SCUM Manifesto” (Society for Cutting Up Men), the women Nutt depicted are hypersexual, self-mutilating, and often violent and violated amputated misfits. Some are tattooed with products clipped from department-store catalogues. Painted with acrylic on Plexiglas, the wanton creatures beckon from a dazzling world of depravity like the covers of glossy women’s magazines, those manuals of hair and skin fetishism that passes for normal. Nutt’s portrayals matured as he did, so that in his paintings of the early 1990s, the posers no longer appear to be wayward women of the city but self-possessed females. Their clothes are couture, their hairdos modernist sculptures, and their eyes asymmetric from excessive plastic surgery. Medusas of the suburbs, they have noses with the power to mesmerize and subdue onlookers. Prim but gaudy, these women resemble that special class of lady philanthropist, art collector, and aristocrat well known to successful painters. 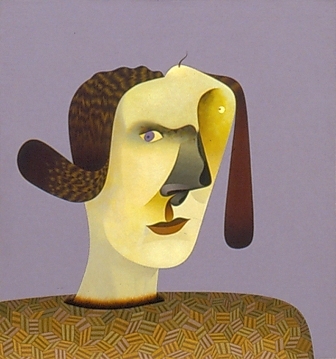 In the late 1980s Nutt transitioned from cartoonish, color-block painting to a technique reminiscent of that of the Old Masters. The surfaces are complex but precise and generous with lush detail. Still Nutt’s early love affair with comics sometimes bubbles up as disfiguring tumors on his female subjects faces, repressed desire surging into shapes. They are all characters, not real sitters, and those of the past 20 years seem to be composites and iterations of a single totemic Woman. Part of the joy of Nutt’s work is identifying sources, as he knowingly plays with the canon of portraiture. The references to his contemporaries John Currin and George Condo throw their works into clearer focus, while hints abound of Pablo Picasso, Jean-Auguste-Dominque Ingres, Francis Bacon, Leon Golub, and Gladys Nilsson, Nutt’s wife and a successful artist who’s been painting beside him for 50 years. To illuminate these influences, the MCA has organized a companion exhibition of more than 80 artworks that converge thematically with Nutt’s. Surprisingly fresh in this context are the pieces by Wilfredo Lam and Enrico Baj; equally noteworthy are those by younger artists, such as Rachel Niffenegger and Paul Nudd. This coterie proves that strange faces are not anomalies in the history of art but welcome friends.